One Sunday morning we actually clicked the heat on in the house for the first time. It was a lovely, crisp fall (but not fall) morning that called for some good coffee. I used the canned pumpkin, but would highly recommend using the syrup to non-insulin challenged people. The tiny bits of pumpkin make the drink pretty thick and settle to the bottom. Also involving coffee, at my husband’s request I made espresso chocolate chip cookies for having family over on Saturday. Do you have any good fall recipes to recommend? 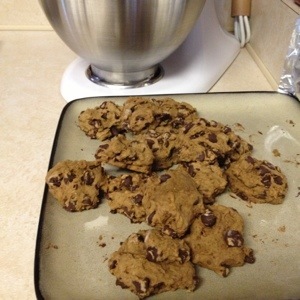 Posted on September 17, 2012, in Family, Food, My Life and tagged baking, Coffee, fall, Family, Food, my life, Recipe. Bookmark the permalink. 4 Comments. I don’t have any fall recipes to recommend but I did want to share with you my love for fall 🙂 We don’t have control of the heat in our apartment (bummer!) but was actually surprised they didn’t put it on a few mornings last week. I’m glad they didn’t but it was a bit chilly. My daughter has a pumpkin spice latte using real pumpkin that she makes in a crockpot. It was very good and didn’t mess too much with my BG. I need to get it from her so I can make it at home. Love me some pumpkin – anything.